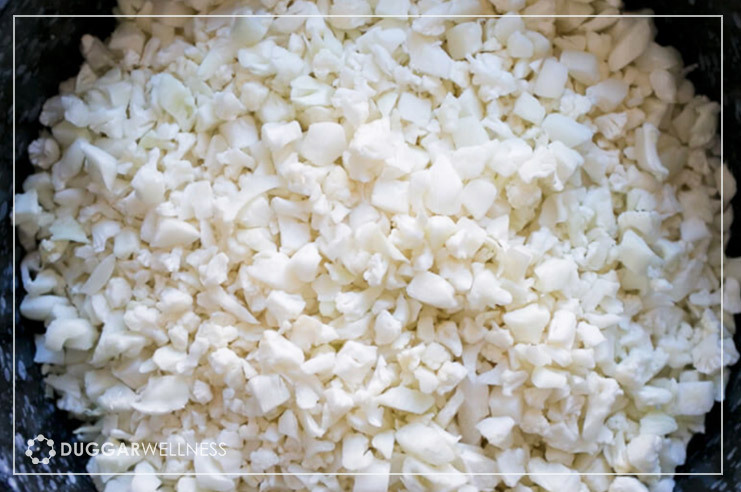 As a member of the cruciferous family cauliflower contains an array of nutrients including vitamins, minerals, antioxidants, phytochemicals, and fiber. Cauliflower has gone from being a “boring” vegetable to being one of the hottest veggies on the market. From “mashed-potatoes” “rice” and even “pizza crust” cauliflower is making its place in the veggie world as an extremist in versatility. Cauliflower is often overshadowed by its green cousin broccoli. 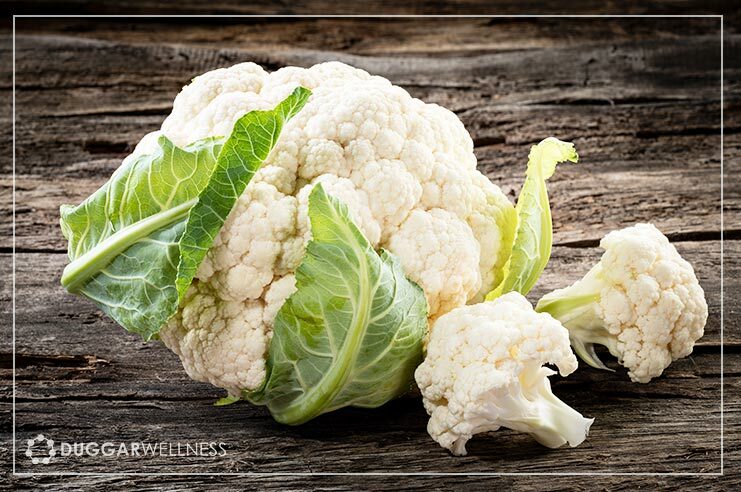 Cauliflower can be eaten raw, added to salads or use it in cooking, so don’t neglect including this amazing veggie into your weekly meal plan. If versatility isn’t enough to excite you about using cauliflower more, these benefits certainly will. Of all the nutrients found in cauliflower, there are 2 that stand out just because of their concentration levels, these are Vitamin C and Vitamin K.
Vitamin C: A single serving of cauliflower has about 70% of the recommended daily amount of vitamin C. Vitamin C is an antioxidant that promotes a strong immune system, aids in many detoxification processes, helps reduce chronic inflammation, assists the body in the production of collagen to build and repair the body’s tissues including the connective tissues, skin and gut lining. Vitamin K: This fat-soluble vitamin is responsible for keeping the skeletal structure healthy and helps prevent conditions related to a loss in bone density loss like osteoporosis. Vitamin K is also needed by the body to help with clotting blood and has a positive impact on inflammation. Consuming cruciferous vegetables like cauliflower has been shown to fight cancer growth in rats and mice during controlled studies, and the same benefit appears to apply to humans. Cruciferous vegetables are also rich in glucosinolates. Glucosinolates are a large group of beneficial sulfur-containing compounds. These compounds are what gives cruciferous vegetables like cabbage, sprouts, and cauliflower their signature smell when they are cooked. Glucosinolates are also protective chemicals are known to break down during the chewing and digestion process into biologically active compounds that help to prevent cancer cells from growing. They are utilized for DNA repair and help prevent cancer by slowing the growth of mutated cancer cells. Inflammation is at the heart of nearly all chronic diseases that are so common today. 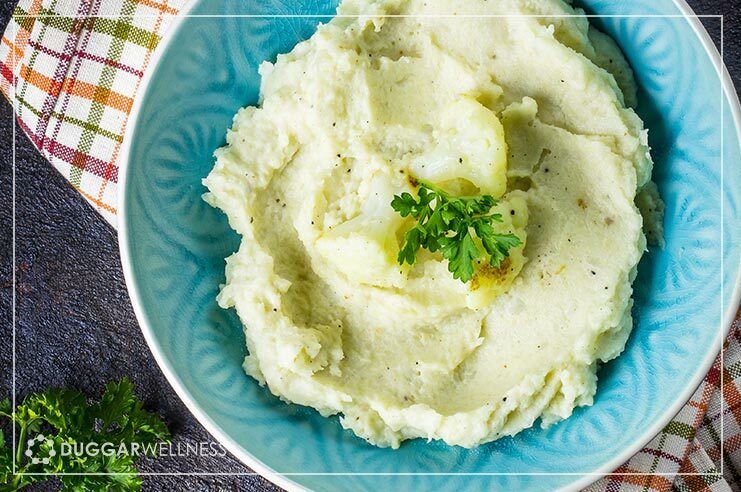 Cauliflower is rich in antioxidant nutrients like vitamin K, vitamin C, and omega-3 fatty acids. These nutrients help lower oxidative stress and the presence of free radicals in the body, thus reducing chronic inflammation. Cauliflower and other cruciferous vegetables contain sulforaphane, glucobrassicin, glucoraphanin, and gluconasturtiian. These are powerful sulfur-containing compounds which support proper nutrient absorption and removal of waste and toxins. Glucosinolates stimulate what is known as phase II enzymes, the body’s natural antioxidant system and help trigger the liver to produce detoxifying enzymes that block free radical damage. Glucosinolates can also help protect the vulnerable lining of the stomach, reducing the chances of developing leaky gut syndrome or other digestive disorders. At the same time, these compounds facilitate proper digestion by preventing bacterial overgrowth from occurring in the gut microflora, keeping bad bacteria from overwhelming the digestive system and allowing good bacteria to thrive. 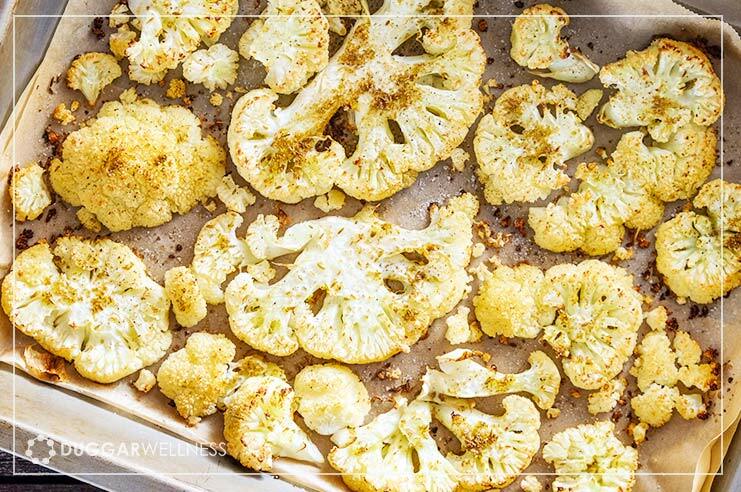 Best ways to pick, prepare & partake of cauliflower. When it comes to purchasing cauliflower, look for cauliflower that is tightly packed, pressing firmly together and not splaying open. While most cauliflower is found in white verities, other types like purple, yellow and green can also be found and are just as nutritious. No matter the type or color you choose, look for a uniform texture and color across the whole head of cauliflower and no major bruises or color spots on the cauliflower head. Store cauliflower in the refrigerator and use within three to seven days. Uncooked cauliflower will last longer than cooked cauliflower, so pre-cooking is not recommended. The very best method for cooking cauliflower to retain the highest concentration of nutrients is to gently sauté it on the stove top. You can saute using a bit of water, broth, lemon juice or a healthy source of fat. Using a healthy fat, like avocado oil, coconut oil, or ghee will help you absorb more of the nutrients, especially vitamin K.
Of course, eating cauliflower raw also preserves its nutrients. So if you’re a hurry to make that weeknight dinner, cauliflower can be prepared quickly or even chopped up and eaten raw. I have added some of our favorite cauliflower containing recipes below. Thyroid Function: According to the research, it takes a large amount of cruciferous vegetables to cause hypothyroidism, and it appears that this risk only exists for those who already have an iodine deficiency. If you have a known thyroid problem, its best to consume cruciferous vegetables that have been cooked and keep them to about one to two servings daily. Digestive Problems: Some people have a difficult time digesting raw cruciferous vegetables, including cabbage, broccoli, and cauliflower. Cooking these vegetables usually helps relieve the problem. The problem is thought to occur due to the carbohydrates found in these vegetables that do not get broken down entirely in the digestive tract, combined with the high amount of fiber and sulfur. Existing Kidney Stones or Gout: Cruciferous vegetables contain compounds called purines, which can sometimes break down to form uric acid in the urine. If you have a pre-existing condition like kidney stones and gout, you will want to speak with your doctor before consuming large amounts of cauliflower, although in small doses the risk if not thought to be anything to worry about.